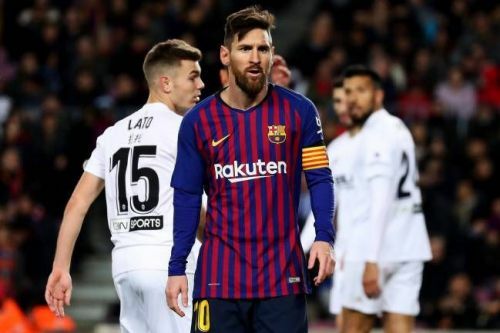 After the 6-1 mauling of Sevilla in the midweek Copa del Rey quarterfinals, red hot Barcelona took on Valencia in front of their home fans at the Camp Nou. Keeping in mind the gruelling schedule ahead for Barcelona, Valverde opted to give rest to Sergio Busquets. The Valencia manager Marcelino has never won against Barcelona and was hoping to pull off a big upset. Valencia made several changes to the squad that eliminated Getafe from Copa del Rey. The Brazilian goalkeeper Neto who has been in terrific form got back into the squad and Kevin Gameiro replaced Santy Mina up front as Marcelino played a defensive 4-4-2 formation. Valverde decided to experiment with Sergi Roberto at the left back position in order to give Jordi Alba some rest. Arthur made way for the experienced Arturo Vidal and the La Masia product Carlos Alena replaced Sergio Busquets in the defensive midfield position. Barcelona dominated possession right from the whistle but could not penetrate into the wall-like Valencia defence. Valencia looked threatening on the counter-attack and a brilliant link up play inside the box resulted in Denis Cheryshev hitting the woodwork. At the 24th minute, Valencia once again countered after dispossessing Messi and this time the Spanish forward Rodrigo made no mistake by making a beautiful pass in tight space to Gameiro. Gameiro struck the ball past Ter Stegen and Valencia took the lead. Sergi Roberto’s needless foul resulted in a penatly for Valencia and their captain Daniel Parejo calmly made the scoreline 2-0. At the 39th minute, Leo Messi brought Barcelona back into the game with a penalty after a foul on Nelson Semedo. After Jordi Alba’s arrival, Barcelona looked more threatening and Leo Messi finally equalized with a pinpoint outside the box shot that left everyone stunned. Here are the three reasons for the draw. 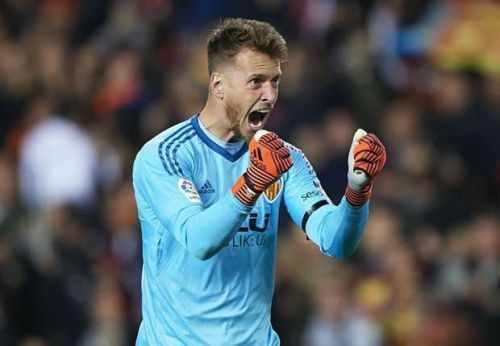 The standard of goalkeeping has never been this high in LaLiga this season and the Brazilian Neto’s performance against a potent Barcelona attack showed the world how hard it is to score a league goal in Spain these days. The standout aspect of this brilliant display between the sticks was Neto’s calmness and concentration in front of a hostile home crowd which continuously whistled him in the second half. He was never overwhelmed by the situation and held his own against some good long-range shooting from Messi and Coutinho. First, he denied Coutinho after he dished out a typical Curler from the right wing and then comfortably collected a freekick from Lionel Messi which was on target to hit the right corner. He once again denied Messi as he positioned himself to his right on the edge of the goal line realizing that Messi loves to cut in and score from his left foot. Overall, this was a night to remember for Neto and Marcelino will be pleased with his performance.